Yesterday I and my hubby had gone for the admission of my daughter in an International school in Mumbai. The interview went well and we were sent to the accounts manager to provide the details about fee structure. After listening to the academic fees, I thanked my hubby for the proper financial planning we did; otherwise it would have not been possible. I would advise all the parents to start their planning today, because the cost of education has gone up drastically. When we were children the career options we had were very limited. I still remember my teacher asking the entire class about what we wanted to become in future and everyone had answered “I want to become a Doctor” or “An Engineer”. Today the scenario has changed. Our children can choose from a lot many career options available to them, but a proper financial planning is essential to fulfill your children’s aspirations. The average cost for education up to 12th standard in a good school has gone up to 1.5 – 3 lakhs per year, and arranging such a high amount is not possible if you haven’t done the financial planning properly. While browsing the internet I came across a website from Axis Mutual Fund. I am really thankful to Axis Mutual Fund to have come up with such a nice website! I felt the process of financial planning for child education is made pretty simple. What you are planning for your child? Where you are planning the education? When you are planning enroll your child for the course? How much is the estimated cost for the education? Once you answer these 4 simple questions, the specially designed financial calculators would present to you the complete analysis and the way by which you can achieve your target. The website gives you an option to select the interest and inflation cost associated to come up with a more accurate cost. It shows you the one-time payment required and the EMI to be deposited in order to achieve the goal. Also there is an option to get help from a professional team of Axis Mutual Fund who will guide on the financial products, details and risks associated with it to guide you better on the investment aspects. So overall the website is a good way to do the financial planning and plan your child’s future. The website has some good eBooks for both children and parents. Painting, short stories and crossword book are very nice with fun and learn approach. If you wish to access it on the go, you can do so with the help of the Homework App. So mommies and daddies plan from today to make your child’s dream come true. 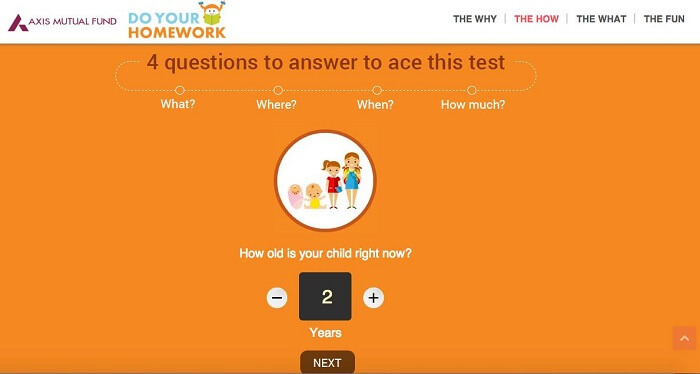 Have you done your homework for your child’s future? Share with me in comments.